Grease a 20cm tart tin with coconut oil. Cut a thin strip of baking paper the height of the tin and line the sides. Place the base ingredients into a food processor or blender and process until a crumb like consistency. Transfer the base mixture to the tart tin and compact down evenly with a cake spatula. Add your filling ingredients to a blender and blend until smooth. Check the taste and add more sweetener if you need. Pour the filling onto the base and evenly spread and smooth out. Place the tart into the freezer for 30-45 minutes to set. Remove from the tin and pull paper off from the sides. 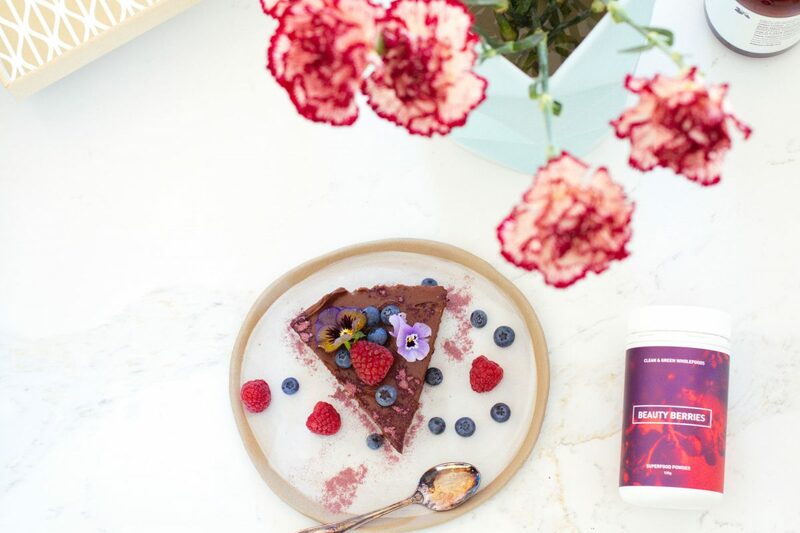 Top with your berries and extra Beauty Berries powder. Enjoy!